68' Hatteras Enclosed Bridge. With a big mezzanine deck overlooking the cockpit and a whopping 21-foot, 6-inch beam, the Hatteras 68 Convertible is more than just a "big" 68-footer, she's gargantuan. Her broad hull form is a semi-V form with a well-flared bow an only two degrees of deadrise at the transom. Deep prop tunnels conceal an innovative trim-tab arrangement said to control running angles more efficiently than their transom-mounted counterparts. The 68 comes with a four-staterooms, three-head interior boasting a lavish full-beam master with a REAL king bed, walk-in closet, and a built-in dressers. On deck, the 68's 192-square-foot cockpit is the largest of any boat in her class. 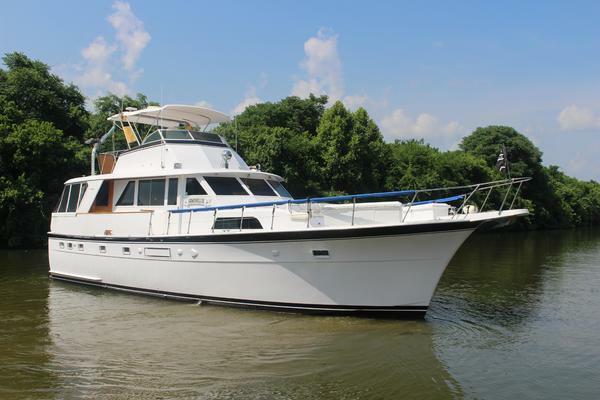 United Yacht Sales New Jersey would love to guide you through a personal showing of this 68' Hatteras 68 Enclosed Bridge 2011. This yacht for sale is located in Aventura, Florida and priced at $2,090,000. For a showing please contact us by filling out the form on this page and we will get back to you shortly!